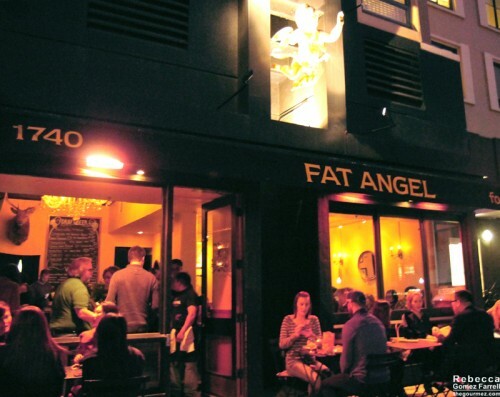 Fat Angel’s menu is focused on nibbles to go with their exceptionally long list of beers, wines, and meads, including after-dinner selections for all of their beverage categories. 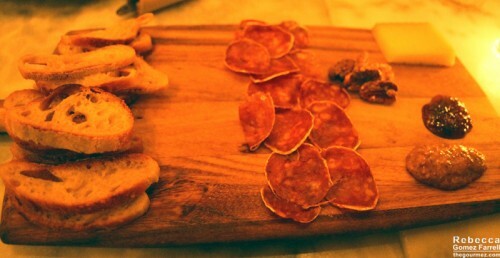 As usually happens, that leads to meat and cheese boards, nuts and olives, and in their case, a selection of fancy butter schmears served with Firebrand breads. Because they also offer flatbreads, salads, and a trio of larger plates, Fat Angel doesn’t operate quite like the typical trendy wine/beer bar. 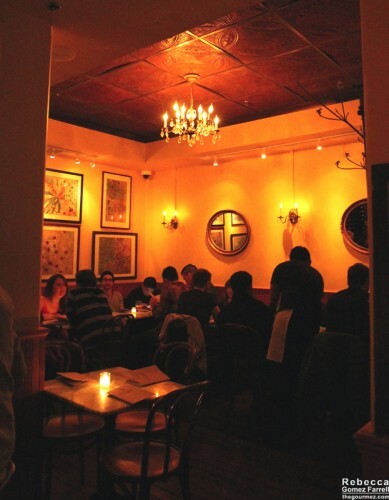 They do, typically, not take reservations, but you don’t have to fight for elbow room and hunker over a tiny corner of surface space and can instead enjoy your meal with friends in relative peacefulness after your wait is over—ours took about 20 minutes for 3 people at 8 pm on a Saturday. We opted to start with one meat and one cheese, choosing the El Trigal semi-hard sheep’s cheese and the salametto piccante for $10.25 total. I don’t think I’d order either the meat or cheese again—the meat was too dry and thinly sliced to leave an impression, and the cheese had good texture but not much flavor. The most memorable part of the cheeseboard was the jam, which was overloaded with vanilla bean. Like wow. That was a lot of vanilla! Perhaps lovers of vanilla would be pleased? For me, it was too much, especially in light of meat and cheese that couldn’t stand up to it. Of course, the mac and cheese was the real reason I was there. It’s one of Fat Angel’s larger plates. Cheese: Gruyere, cheddar, and Parmigiano-Reggiano. The cheddar stood out most, which I consider essential for a good mac and cheese. I’ve had enough at this point to know cheddar really is better. Creamy vs. Stringy: Creamy. I have had few stringy contenders during these mac and cheese nights. I guess the Bay Area prefers their mac and cheese saucy? This béchamel cheese sauce was possibly too thick, in that it threatened to congeal fast. But it did taste luxurious. Of note, a ton of cayenne is mixed into the sauce as well, making for a very spicy dish! We loved the spice. It actually tasted more like jalapeno than cayenne, to the point that I wondered if jalapeno had been pureed into the sauce, but the ingredient list verifies cayenne as the spice factor. Noodles: Corkscrew, cooked almost to the point of falling apart. I have learned that overcooked is a good thing for mac and cheese, as it contributes to making it all come together as one dish rather than disparate elements. Breadcrumbs: Sparse, fine dice, and toasted croutons of bread. Just the right amount not to detract from the dish. Verdict: This is a definite contender for best mac and cheese. The heat of the cayenne made every bite stand out and it did the important job of cutting through the rich sauce. Great cheddar flavor. Will happily eat again. My husband, who’s cut carbs out of his diet, went for the romaine salad instead ($12). 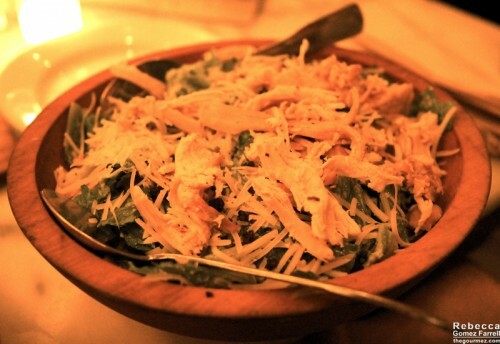 He added roast chicken for $3, and without the chicken, the salad would be on the boring side. Interestingly, the salad includes fried capers, whose texture and salty flavor actually gave a nice approximation of anchovies. It’s a unique caesar but could use livening up. Friend #1 had the chicken pot pie ($13; I mainly feasted on mac and cheese). It used the same roast chicken as the salad and boasts of carrots, sherry, and tarragon on the ingredient list. Perhaps unsurprisingly for our Fat Angel experience, it needed more flavor and we had to hunt down the waiter to acquire salt and pepper. 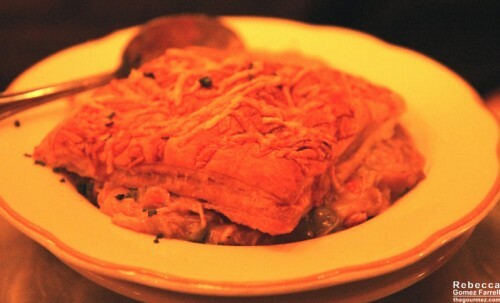 Good chunks of chicken and a nice pastry crust, but not a stand-out selection. Now that I’ve written up the review, my impression of Fat Angel has become clear. 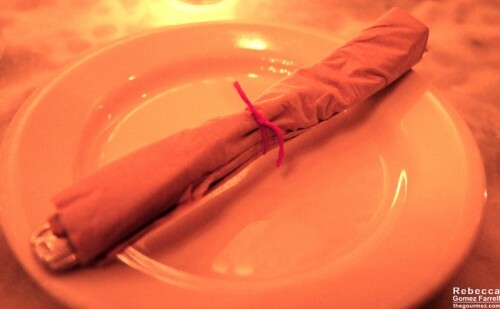 While offering some inventive ingredients, most of our selections underwhelmed. 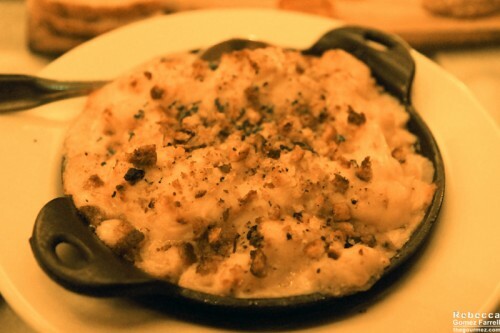 But the drink offerings are great, and the mac and cheese is worth coming for all on its own. Pair all that with a pleasant atmosphere and sure, I’d drop in again. As long as an order of the mac and cheese is placed for the table. LOL. Kelley Carpenter, I’ve mentioned in other threads that the only crockpot recipe I’ve loved has been a mac & cheese one. I’m sure it has nothing to do with the POUNDS of cheese involved.